Is an HST Rebate Revenue? Does the HST rebate get reported as income? This is a question that came in through my e-mail this week. The short answer is no, it does not. Next question may be, why not? First of all, you collect money from your clients and that is reported as revenue (income). If you receive an HST rebate at the end of your reporting period, the government is giving back the money you spent paying HST on purchases. The money spent was reported as revenue once before and therefor, the rebate does not get reported as revenue a second time. If you are using Quickbooks, Sage or some other accounting software, the transactions are all properly recorded for you. But what if you’re using a spreadsheet or paper journals? How do you record this? To start, you need a liability account called something like HST Liability. Because this is a liability account it will normally have a credit balance. If it ends up with a debit balance at the end of your reporting period, that means you are getting a rebate. When you get a rebate, the transaction is recorded as a debit to your bank account and a credit to your HST Liability account (to bring that balance back to zero for the next reporting period). So the rebate doesn’t get recorded as revenue because the HST paid, the HST collected and the rebate itself are all tracked through a liability account. If you are using a spreadsheet, set up a separate page just for tracking the HST. Have one column for the Date, one for Description, one for Debit and one for Credit. Use the Description column to link the entry to the purchase/payment the HST relates to. For example, if you received a payment from John Doe for invoice number 27, in the Description column write "Payment received from John Doe Invoice #27". This makes it easier for an auditor to figure out why you recorded this amount of HST on that date. They can refer to invoice #27 and verify that that was the correct amount. If you are recording HST collected from a client/customer it gets recorded as a credit (liability accounts are normally a credit balance remember). 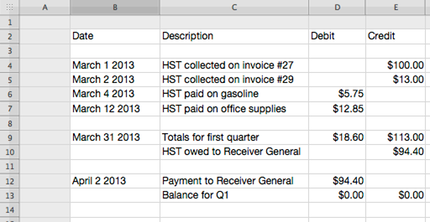 If you are recording HST paid out on a purchase, then it goes in the debit column. At the end of the reporting period (for most sole proprietorships this is done quarterly) you would total the Debit and Credit columns. You then subtract one from the other. If the total debits is higher than the total credits, record the difference in the Debit column and this means you will get a rebate. If the credits are more than the debits, record the difference in the Credit column and that indicates you owe the CRA that amount. 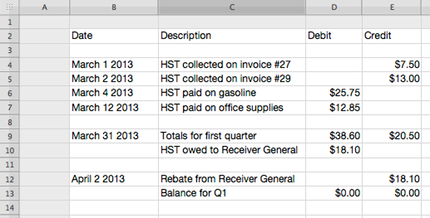 This shows that $200 was taken out of the bank and it resets the HST liability account to zero for the next quarter. The HST liability account does not carry a balance from one reporting period to the next! This shows that the money went to the bank and it resets the HST liability account to zero for the next reporting period. Save a copy of that spreadsheet using the name of the reporting period (example: Q1 2013) then start a new spreadsheet for the next reporting period. If you are still uncertain as to how to deal with this, consult your accountant or acquire the assistance of a bookkeeper.